Tarmeko Pehmemööbel's main line of work lies doing upholstery furniture: sofas, sofabeds, armchairs and ottomans. In many cases the company has made custom orders. In the production process the most important key factors are craftsmanship and quality. Skills, that have been passed on from generation to generation and the best materials are the heart of the production. The company also follows that the materials come from responsible and sustainable sources because the environment is highly cherished by Tarmeko. Upholstery factory's main goal is to follow the latest technological trends and invest in development. This way is Tarmeko Pehmemööbel able to provide best possible quality and added value. Tarmeko Pehmemööbel OÜ owns two trade marks: CF Collection and Carl Fredrik Collection. During the branding phase, CF Collection trademark logo got orange as the main colour with a touch of yellow since this colour is associated with lightness. This suits the trade marks overall image: CF Collection models are modern yet have a elegant, effective and simple look. CF Collection selection is wide and every furniture admirer can find themselves a suitable sofa or armchair. 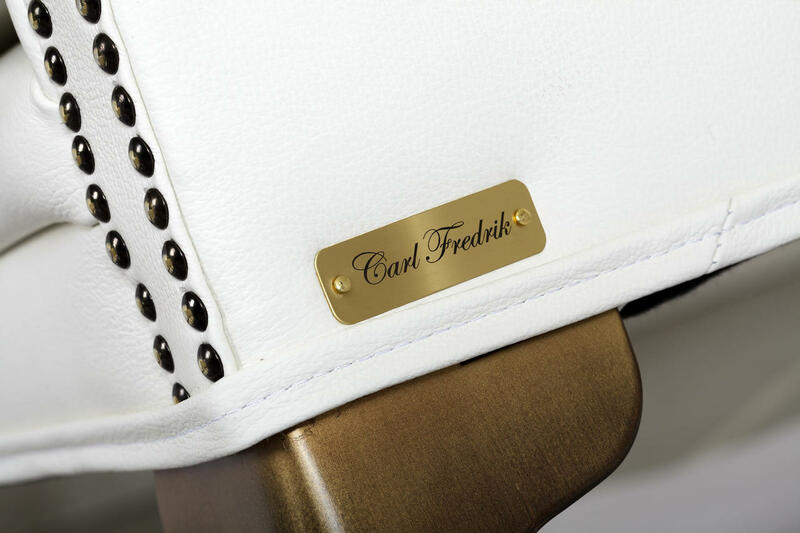 Carl Fredrik Collection trade mark logo got the colour brown with a touch of red because red can be associated with trust and down-to-earth view. This is suitable for Carl Fredrik since the collection is luxurious but has a romantic and historic side. In the collection are sofas, armchairs like Chesterfield, that have a long history and timeless elegance. As mentioned above, Tarmeko upholstery factory makes custom orders. For example furniture for offices, bars, cruise ships, showrooms, restaurants and other public spaces. Custom order sofas have even sent as far as Dubai, China and Singapore but also to exclusive car agencies like Lexus. The upholstery factory is located in Lohkva, together with Tarmeko LPD and Tarmeko Veneer. In the company work all together 60 workers. Tarmeko works together with many different designers and other Estonian furniture producers. This was a brief overview of Tarmeko Pehmemööbel, our upholstery furniture factory. We hope you liked it!